Custom made jewelry can add beauty and elegance to any wardrobe. Everyone loves the idea of unique, custom made jewelry. The best way to get these types of coveted pieces without paying a fortune is to design and create the pieces yourself. Are you interested in learning how to create beaded necklaces on your own? This article will help you make your own custom necklace with relative ease and success. Please read on. First, decide the look you are trying to achieve. Choose the beads that best accomplish the style you seek. Make sure the pattern you choose is accurate. You may find it advantageous to plan a design ahead of time as opposed to trying to design the beaded necklace as you move along. Next, decide the length of your custom beaded necklace. Whatever length you choose, you will need to add a few extra inches to it. This is so you can secure your clasp without taking away from the length. Also, you may choose to double your wire or string for added sturdiness. Now, we need to secure the clasp. Attach the clasp on one end of the necklace. You will need to remove all extra wire or string and use the first few beads to tuck and secure the necklace for a neat and polished look. If you have chosen to use a pattern that employs a repetitive bead work pattern, make sure you have enough beads to finish the look ahead of time. This makes it easy to complete the necklace from start to finish. If you have chosen a centerpiece or focal point for your necklace, measure the beading properly prior to stringing them onto your string or wires. These are the best methods to avoid making any mistake as far as spacing of the work is concerned. It prevents you from assuming you’ve reached the middle of the piece but you are really too far right or left. 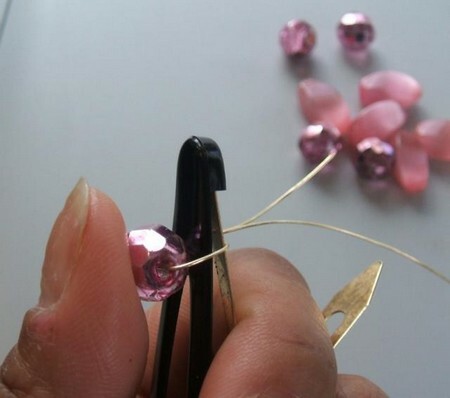 After you have completed all of your beading, you want to secure the necklace on the ends. Remove any excessive strings or wires. Give your new custom designed and made beaded necklace a trial run. Wear the new piece inside the house to make sure it is comfortable and secure enough to wear out. You want to make sure the piece is not going to break in public. If this happens, at least you don’t run the risk of losing all of your special beading. This may make it easier to repair in case of accidents.